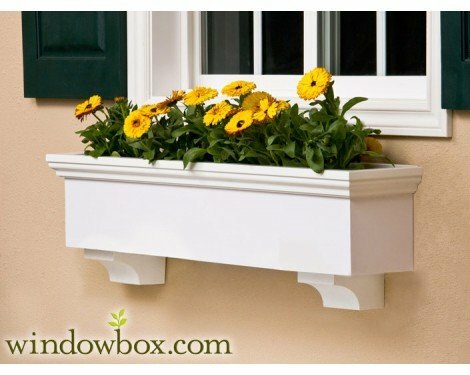 24 Inch New Haven Direct Mount No Rot PVC Composite Flower Window Box w/ 2 Decorative Brackets by Windowbox at Tulips Orchids. MPN: BXI-A2-045-24-2FB. Hurry! Limited time offer. Offer valid only while supplies last. Our New Haven Direct Mount Window Box is made premium grade composite cellular AZEK PVC that will not rot or mildew and is completely insect proof. Our New Haven Direct Mount Window Box is made premium grade composite cellular AZEK PVC that will not rot or mildew and is completely insect proof. These New Haven Direct Mount Window Boxes can be installed in minutes. The AZEK Premier composite PVC looks and acts exactly like wood. All of the "Premier" line of window boxes and planters come in standard white, but you can easily paint them any color to suit your need. You can even Faux decorate/paint them for added texture, color and effect. Brackets are for decorative purposes (not for support) and can be attached to the bottom of the box via PVC cement (recommended) or wood screws at your discretion - cement and/or screws not included.